Bosch Security Systems and Sony on Tuesday announced that they have entered into a partnership that will result in an unprecedented level of cooperation between the two companies’ video surveillance business units. Not only will the collaboration result in a combination of the companies’ respective technologies, but Bosch will be taking over the sales and marketing of Sony-branded products in every market with the exception of Japan. Sony’s video security customers will be served and supported by a dedicated sales and marketing team within Bosch, offering customer support, after-sales service and training in different languages in over 50 countries worldwide. “The global Bosch Security Systems organization will support the dedicated sales and marketing team responsible for Sony-branded products as well as Sony’s customers to grow the business by excellent support and service,” Bosch Security Systems President Gert van Iperen said in a statement. 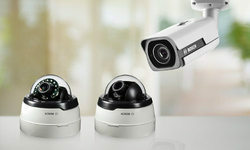 Bosch announces the introduction of a complete new lineup of intelligent cameras within its mid range portfolio. The fixed dome (FlexiDome) and bullet (Dinion) IP 4000i, IP 5000i and IP 6000i cameras now have Essential video analytics built in as a standard (intelligent) feature, enabling the network video cameras to understand what they’re seeing, generating metadata to add sense and structure to the video footage, according to the company. This mean that instead of simply capturing and storing video data, users can now use the metadata alongside the video footage to improve their level of security and assist in making business decisions using a wealth of statistics. The intelligent cameras can also be used beyond security applications, such as in a business retail environment. Bosch says the IP 4000i, IP 5000i and IP 6000i cameras can gather statistics such as the number of people entering or leaving a store, or identify patterns in customer activity in order to optimize store layouts, improve customer experiences and bolster sales. The cameras are available in a range of resolutions, from 720p up to 5 megapixels, with frame rates up to 60 frames per second. The Dinion IP starlight 6000i IR bullet camera also features Bosch starlight technology for challenging lighting conditions. All IP 4000i, IP 5000i and IP 6000i cameras offer intelligent dynamic noise reduction and intelligent streaming, along with H.265 video compression. The cameras ensure backward compatibility by supporting legacy H.264 systems that do not yet support H.265. Setting a new industry benchmark, Bosch recently introduced the PRAESENSA, the company’s latest Public Address and Voice Alarm System that is both fully-featured and IP-based. All components of the PRAESENSA system are networked, ensuring the highest flexibility and scalability from small centralised to large decentralised systems. 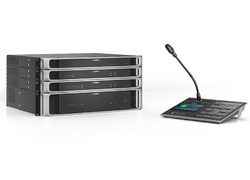 The Bosch OMNEO IP architecture supports Dante audio networking, AES67 and AES70 protocol. The PRAESENSA offers special features for the highest level of data security and full network link redundancy with smart integration of functions and backup facilities. No single point of failure is core to the system concept and only a few different devices are needed to fulfil all system and user needs. It also offers full sound control per zone to create the right atmosphere with background music and to meet speech intelligibility requirements for business and emergency operations. The system features a multi-channel amplifier architecture with intelligent power allocation across the amplifier outputs and integrated spare channel, improving the effective utilisation of available power regardless of the loudspeaker load in each zone. As a result, fewer amplifiers are needed, saving up to 50% on space, energy and backup battery power. Other devices used in the PRAESENSA system include the PRA-MPS3 multifunction power supply, combining multiple functions into a single compact device to serve several PRAESENSA devices. It acts as an enabler for decentralised system topologies with several smaller racks or cabinets located across the premises to reduce loudspeaker cabling costs, but can also be used in a centralised system. The intuitive interface of the PRA-CSLD Desktop LCD call station provides an optimised user experience through an effective combination of touch screen and selection buttons, with the PRA-CSE call station extension. Clear progress guidance and status feedback ensure comfort and ease of use for operators. There is also the PRA-CSLW Wallmount LCD call station, which provides a hand-held omni-directional microphone, as well as a built-in loudspeaker for call monitoring and a socket to connect a local background music source. It can be installed in a wall mount cabinet, or flush mounted on a panel. The PRAESENSA is the latest in innovations since the first networked digital Public Address and Voice Alarm System that Bosch introduced 15 years ago, and will be available at the end of this year.